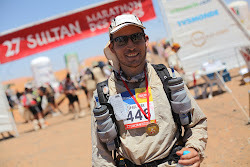 The other day we received an email update from the organisers of the MDS talking about feet preparation. It seems that a lot of people try to toughen their feet up in the weeks before the race, to try and reduce the number of blisters that they are likely to suffer. It mentioned various substances that can be used, but the one that I already happen to have here at home is surgical spirit. Each evening now I will soak my feet for a few minutes in a bowl with a little bit of surgical spirit in the bottom. I will report back how it works and if I notice any changes.